Imagine taking a hike over soft, ever shifting sands. This is exactly what Martina Klose, a researcher at USDA, did when she captured this beautiful photograph. While most of us will likely think of deserts as inhospitable and static landscapes, they can tell us much about dune forming processes, as Martina explains in today’s blog post. The photograph shows the view down from the crest of a megadune in the Badain Jaran Desert in China. It was taken during a two-day field trip in the course of the International Conference on Aeolian Research (ICAR) VIII, which took place in Lanzhou, China, in 2014. 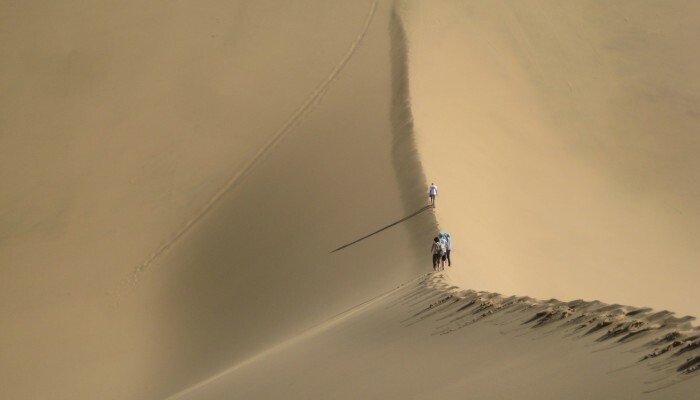 The Badain Jaran desert is located north of the Hexi Corridor in western Inner Mongolia and is one of the largest areas of shifting sands in China. With maximum dune heights of a few hundred meters, the Badain Jaran Sand Sea hosts some of the largest megadunes in the world. The sand sea is not only dry, however – amongst the dunes are a number of lakes of various sizes, creating a picturesque environment. You can see what it looks like from space by following the link to this NASA satellite image! In general, wind is the driving force for dune formation. In the case of the Badain Jaran Sand Sea, the local topography and the subsurface water source are likely additional factors contributing to the development and evolution of the dune fields. After a long bus drive on the way to the sand sea, climbing one of the giant dunes was a welcoming exercise for most of the conference participants – rewarded with a stunning view from the dune crest and optionally a fun slide down the dune slope.